Vic Law fires a shot. The senior forward and the Wildcats opened their season with a victory over New Orleans. 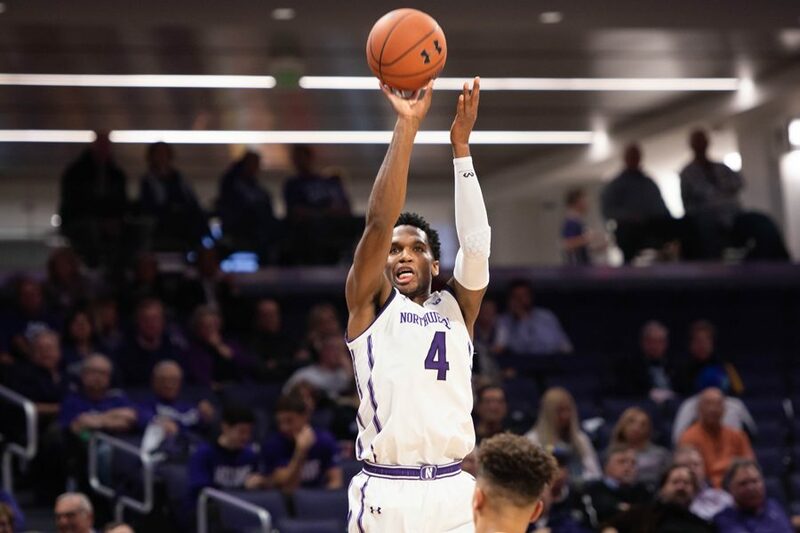 In the first regular season game in the new Welsh-Ryan Arena, Northwestern handled New Orleans with an 82-52 victory on Thursday evening. The Wildcats’ veteran leadership took control of the game as senior guard Ryan Taylor scored 20 points and fellow seniors Dererk Pardon and Vic Law combined to add 31 points. The Wildcats (1-0) struggled to start the second half, but eventually pulled away from the Privateers (0-1). NU got off to a hot start and scored the first 9 points, aided by 3-pointers from Law and Taylor and the first career basket by Miller Kopp hit the first jump shot of his collegiate career. The two seniors combined to hit six 3s in the first half, but after Law’s final three pointer extended the lead to 29-16, New Orleans went on a run; the Pioneers trailed by just 8 at halftime. In the second half, NU hit a cold stretch, missing six straight field goals at one point and allowing the Privateers to draw ever closer. But the Cats regained their stride, and pulled away in the final minutes to win by a comfortable 30-point margin. 1. NU still has intermittent scoring issues. Despite the win, the Cats didn’t shoot the ball phenomenally well; they finished the game with a 42 field goal percentage. After ranking 13th in the Big Ten in scoring last season, NU implemented a new offense to begin the season. Even still, the Cats’ offense couldn’t find a rhythm. At one point in the second half, NU had an almost four-minute stretch where they didn’t score. 2. Vic Law is taking the scoring reins. After the graduation of Bryant McIntosh and Scottie Lindsey, Law was seen as the logical player to step up as NU’s primary scorer. The senior forward, who became the 36th player in Wildcats’ history to score 1,000 points, took a step in that direction on Thursday: He was efficient all game, scoring 18 points on 6-of-12 shooting, including 3-6 on three pointers — just in the first half. 3. Ryan Taylor is as good as advertised. The graduate transfer from Evansville was expected to help the Cats offensively after leading the Missouri Valley Conference with 21.3 points per game last season. Taylor picked up right where he left off, scoring 20 points in his Northwestern debut, including six 3-pointers. If he can continue to produce like he did against New Orleans, he could be a great offensive complement to Law.